The Western Yacht Club has a very interesting and checkered history. The following article by Adrian O'Connell traces its origins as the 'Royal Western Yacht Club of Ireland' up to the present day. The ingenious ideas of Sir William Petty in the mid-1600s in Dublin, when he constructed a catamaran to prove that he would be able to transport the Royal Mail across the Irish Sea to Anglesey at over twice the speed of the then Mail Boat, fell on deaf ears, though nearly four centuries later high speed catamarans ply the same routes providing the same service. Patty’s ideas established Dublin as an area of maritime experimentation for many years to come, when yacht and sailing clubs developed all around the coast of Ireland in the 19th Century. In 1720 or thereabouts the Water Club of Cork Harbour was established by local gentlemen who had suitable seagoing vessels. The organisers drew up a set of rules to keep the membership in line and developing in the right direction. At first the membership was limited to six and then enlarged to 25; however exclusivity was the rule, keeping out the unruly elements (possibly still to be found around the waters of Ireland today…). The Club had a rule where if the Club Secretary allowed a non-member into the Club House he would be instantly dismissed. Fortnightly sailing excursions and dinner parties were arranged to correspond with the Spring tides. The members neither cruised or raced but manoeuvred under the command of an Admiral and carried out fleet manoeuvres in Naval fashion. The sailing discipline had to be adhered to at all times and the fleet was controlled by flag signals hoisted by the flagship. The Club went into decline around 1765 but re-established itself in 1806. One of the Water Club members was Col. John Bateman Fitzgerald Knight of Glin. When he built Glin Castle on the south shore of the Shannon Estuary, he had the yacht Farmer, a large 18 gun brig, built in 1780 to enjoy sailing and cruising all along the west coast. Five years previously the Royal Thames Yacht Club of London was established when the Cumberland Fleet was formed. Apathy and acrimony destroyed the original club, the present club was established with a Royal Warrant being issued in 1830. Down in Cork a rash of new royal yacht clubs were being formed. In 1872 the Munster Model Yacht Club was founded as a Corinthian or Amateur Yacht Club to provide the basis of amateur racing without monetary rewards, as against the professionally crewed racing fleets of wealthy owners who raced for wagers. This club was eventually named the Royal Munster Yacht Club and though clubless for many years, it settled in the Clubhouse of the Cork Harbour Motor Yacht Club at Crosshaven in the 1930s. The Royal Munster merged with the dormant Royal Cork Yacht Club of Cobh which claimed its decendancy from the original Cork Water Club of 1720. In fact, the Royal writ establishing the Royal Cork was given in 1831 and it subsequently established itself where it is today in Crosshaven. On the Shannon Estuary, with the Knight of Glin’s encouragement, the numbers of commercial local sailing trading vessels was growing apace with the establishment of towns and sea-going trade along the estuary. It soon became an established fact of life during the summer months that interested groups organised regattas for all the types of craft at each small port to be found on the estuary. The types of vessels comprised trading brigs and cutters, some as large as 250 tons and others as small as 6tons, turf boats, hookers, gleoitoigs, canoes/canvas currachs, gondolas, briccawnes, etc. Committee Members: Crofton M. Vandeleur, Col. John Vandeleur, Maurice O’Connell (a son of the Liberator), The Knight of Glin, William Piercy, John Bindon Scott, John Hamilton, Poole Hickman, Hon. J.P. Verecker, Richard Quin Sleeman, Francis Spaight, Robert S. Unthank, Richard Russell, Daniel C. Hartnett, Thomas Barclay, Jonas Studdert, Stephen Creagh, Thomas Browne, William Monsell, John O’Connell (2nd son of the Liberator) and David P. Thomson. The Club membership in 1837 stood at 201 with a total of 82 sailing vessels, though not all the membership or vessels were based on the Shannon Estuary. On the 16th January 1832 their Lordships at the Admiralty gave permission for the Royal Western Yacht Club of Ireland members to fly a White Ensign with a Red Cross, a crown in the centre with a wreath of shamrocks surrounding it and the Union Flag at the head of the ensign. In 1832 the Club produced a very comprehensive Book of Signal Codes and all members were given their own specific Code Flag for ease of recognition at sea. The Code Book was produced in colour and was very advanced for its time, as it allowed members on meeting another member at sea or at anchor to inquire as to their health, whether they had drink, food or women on board, etc., as well as many less important requirements. The Royal Western held Regattas at Galway, Sligo, Westport and Belfast which encouraged the establishment of the Royal Northern Yacht Club which subsequently moved across to the Clyde. The Rinvella Plate which resides on the Dining Room Sideboard at Glin Castle today was won by the then Knight of Glin at the Galway Regatta. The Royal Western’s material resources were considerable in the mid 1850s as they had a Club House at 113 Grafton Street, Dublin, and a floating Club House – the 123 ton Cutter Owen Glendower based in Dun Laoghaire Harbour, for social functions afloat away from the prying eyes of the law. In 1858 the right to fly the defaced White Ensign was withdrawn by the Admiralty as their Lordships had decided in 1842 that only Naval Vessels and members of the Royal Yacht Squadron would be allowed to fly the White. As a result the leave to fly the Ensign was withdrawn from all Yacht Clubs: however, the defaced White Ensign as issued to the Royal Western of Ireland was overlooked and after complaints made by the members of the Royal Yacht Squadron to the Admiralty about the matter, their Lordships at the Admiralty decided that for the present the Royal Western Yacht Club of Ireland could continue, especially as being mainly based on the West Coast of Ireland and with a small membership, their continuation might go unnoticed. The membership of the Royal Yacht Squadron continued to object, on the basis that there was a major distinction between their membership and the lowly Irish, who needless to say had a considerable number of titled gentlemen on their membership list. However the yearly subscription was only 1 Guinea be a member of the Royal Western – and one didn’t have to own a yacht! – as against the many hundreds of Guineas required for membership of the Royal Yacht Squadron, plus having to personally associate with the English Monarch. After the Great Famine of 1844/46 the population of Ireland had been more than halved, the West Coast had suffered the most, many boats lay rotting in the small harbours all around the coast with nobody to sail them. Their owners mainly Irish or Anglo-Irish gentry had bankrupted themselves as a result of the loss of tenant revenue and in a lot of cases as a result of their attempts to help, feed and nurture their tenants. They lost their estates under the Encumber Estates Act losing their yachts/sailing trading vessels as well, their properties being taken over by often absentee Landlords from the more wealthy areas of the UK who used their Irish residences as summer holiday homes rather than permanent bases. Many of these new landed gentry were products of the industrial revolution in England, an example being the Burtons of Carraigaholt who had a 50ft+ yawl which they sailed out of Carraigaholt. As a result of the ravages of the famine and the post famine era, the main centres of population continued to maintain and develop sailing and yacht clubs, though there had been considerable re-arrangement and amalgamation of clubs. The Dublin membership of the Royal Western had run very successful regattas in Dublin in 1854 and 1856, which were very popular and well reported. These regattas were run under the Corinthian principles: amateur and handicaps as today rather than for the then traditional wager or bets akin to horse racing with paid professional hands on deck, in fact a yacht competing had to leave all paid hands ashore and this is today portrayed by the Jockey Rule. With the demise of the Royal Western the membership reformed under the guise of the Kingstown Model Yacht Club in 1857 which was subsequently changed to the Prince Alfred Yacht Club in 1864 and later in 1870 to the Royal Alfred Yacht Club which today though the membership possess no Club House, organises and runs all Yacht Racing in Dun Laoghaire, except for club regattas, all of this under the Corinthian traditions long established by the Royal Western and in fact traditionalists in the Alfred maintain through their Royal Western links, to be the oldest amateur yacht racing organization in the world. Meanwhile, in Cobh in Cork, the remaining Royal Western membership there had, in 1862, obtained an Admiralty Warrant to fly the Blue Ensign under the title Royal Western Yacht Club of Ireland, based at the Queenstown Yacht Club, formed in 1860 and subsequently disbanded and replaced by its new title and distinctions. The new Royal Western obtained the following year the Queens Cup for yacht racing from Queen Victoria and, as previously mentioned, all the Cork yacht clubs were subsequently amalgamated into the present Royal Cork. In early September of 1984 the Club was re-established as the Western Yacht Club at Inrush, its founding base, and this was headed by such people as Brendan McMahon, Hugh McKiernan, Dan Beazley, Fintan Keating, Paudie Eustace, Richard Glynn and Gerald Griffin and many others interested in supporting the development of sailing. Kilrush Marina was constructed in 1991 by Shannon Development to provide the infrastructure for the development of yachting on the west coast. This new development provided the secure walk-on/walk-off mooring facilities so badly needed which, over a period of time, resulted in a major increase in the numbers of locally-owned and based yachts, which in turn further developed the Club and increased its membership: the result being a very active Club in the traditions of the Royal Western of Ireland with many good yacht racing events taking place and organised by the Club, such as the yearly October series. So from Kilrush big oaks have grown from little acorns and we all may be extremely proud of the great traditions established so many years ago by sailors who were just as enthusiastic as we are today but hadn't got the modern systems available to us today to communicate, but who nevertheless succeeded in running some amazing sailing events. The Shannon Estuary and its sailors had an input into the Americas Cup in that Lt. Penn, the son of the then Chief Justice of Ireland who lived at Paradise House on the Fergus Estuary, competed against the New York Yacht Club entry in his yacht which was reputed to be maintained on a mooring in the pool opposite to Paradise. Likewise the Earl of Dunraven instituted a challenge for the Americas Cup with his yacht Valkerie – this ended in court as a result of the rules being changed on the race course! In closing I would like to mention that much effort should be made to obtain the original Club Warrants and Establishment Writs, as much as to re-establish the present Clubs true identity as well as making the Club more attractive for visiting yachtsmen to join, so as to allow them obtain a Royal identity as such through the back door: a very attractive proposition for Americans as well as UK yachtsmen who might not be able to afford the luxury at their home port. Another interesting point is that the Crown depicted on the Royal Western Flags is the Prince of Wales’s Crown and not the Monarchs Crown with the Orbs and Cross as Ruler of the Empire and Defender of the Faith. The membership of the Royal Western were being extremely democratic in selecting this emblem in that they were not accepting total allegiance to the Crown or the then established Religion. Thus the Royal Western established a Royal Club in name which encompassed all people of all religions and political persuasions in Ireland and all over the world where people went on sea in small vessels to enjoy the freedom of the sea. The often spoke of adage ‘the Land divides us and the Sea brings us together as one’ is still important today as it was so many years ago. Western Yacht Club is located in Kilrush on the Shannon Estuary. Kilrush Marina provides a 120 berth marina which has excellent facilities available to all visitors. The town of Kilrush is only a five minute walk and offers many pubs, resturants and shops. During the summer months we have racing on wednesday evenings and we also hold annual October Series with racing in IRC and Echo. At the recent UIM (Union Internationale Motonautique) general assembly, the ISA was formally (and unanimously) approved as the recognised UIM member governing powerboat racing in Southern Ireland. This is another step towards developing our commitment to promote motor boating activities in Ireland. The ISA constantly monitors and reviews developments in sailing and boating and represents the interests of its members and other sailing and boating enthusiasts with government and international agencies. The ISA has initiated the process of developing our third strategic plan (2009–2013) so that they can work to improve our services for the benefit of all boaters and sailors in the future. 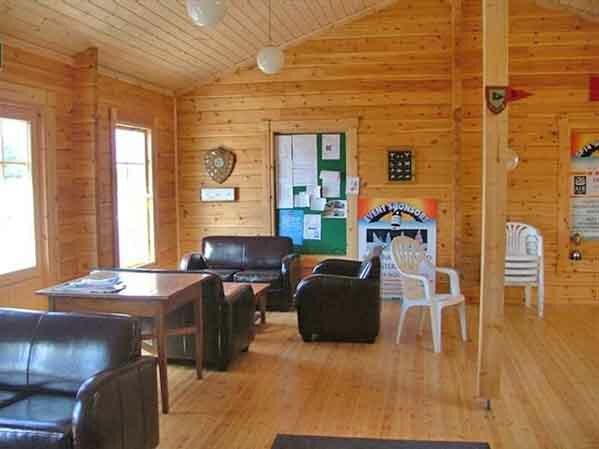 Facilities include water-skiing, power boating, board sailing and sailing. 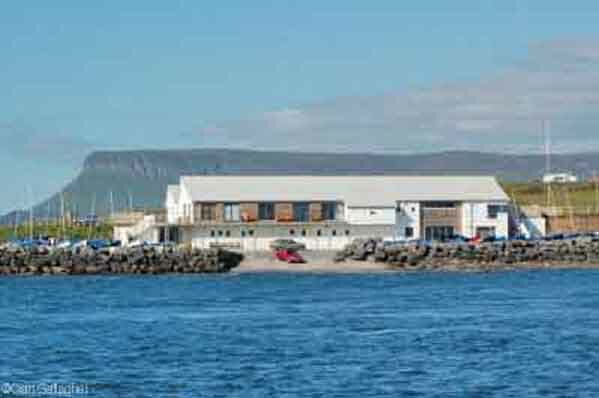 Sligo Yacht Club is located in Rosses Point on the edge of Sligo Bay – one of the most ideal and beautiful locations for inshore racing in the country. 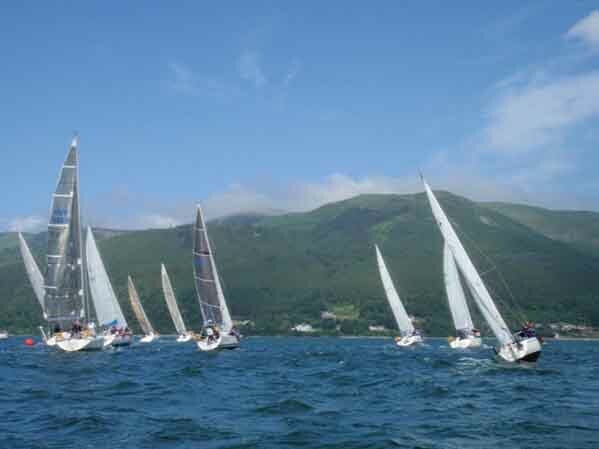 The original Sligo Yacht Club was founded in 1821 and did most of its racing on Lough Gill. Records show that the club was not active since the end of the 19th century and was completely disbanded at the turn of the century. However, despite the non existence of a sailing club, Sligo had an excellent maritime history and there were several sailing craft on Lough Gill and Sligo Bay. In 1965, six enthusiastic sailors got together to build GP14 class dinghies and these sailors formed the nucleus of the reactivated Sligo Yacht Club. Racing in GP14s took place in spring and autumn on Lough Gill, and during the summer months Sligo Bay was the venue for club racing. In the early 70s, Sligo Yacht Club commenced building the present Club house which was formally opened by the late President Childers on 14th September 1973. In the last few years the Clubhouse has been extended and in 1987, the America's Cup Bar was added. Sligo Yacht Club has a healthy fleet of some 40 GP14s, 30 Mirrors, Laser Picos, Lasers and an ever increasing Cruiser Class. Racing for Cruisers take place on Wednesday and Fridays. The GP14s race on Tuesdays, Thursdays and Sundays while the Mirrors take to the water every day of the week during the summer holidays. The Club has a very enthusiastic Junior section and each year there is a well attended Junior Sail Training Course run under the auspices of the Irish Sailing Association. Introductory sailing for adults occurs early each spring and during the summer. Running championships at National, European, and even World level does not present problems for Sligo Yacht Club. Sligo has a reputation for hosting major championships with a professionalism that is byword in sailing circles. The Club provides a 'happy mix' of excellent racing facilities backed up by a social programme that makes it one of the top clubs in the country. Sligo Yacht Club hosted the Enterprise World Championships in 1979. In 1977 and again in 1980, the Scorpion Class held their European Championship in Sligo. The IDRA 14 Dinghy Class National Championships were hosted by Sligo in 1976, 1978, 1982 and 1983. The Club also hosted two very successful Dinghy Weeks in 1978 and again in 1983. Mirror Week incorporating Junior and Senior National Championships was first hosted by Sligo in 1974, ten years later in 1984, in 1999 and again in 2003. In 1987, the Mirror World Championships took place in Sligo. In 2008, the Mirror European Championships will be held in Sligo. In 1998, Sligo Yacht Club welcomed visitors from all over the country to Rosses Point for the GP14 National Championships, and in 2000 the Mermaid Nationals. 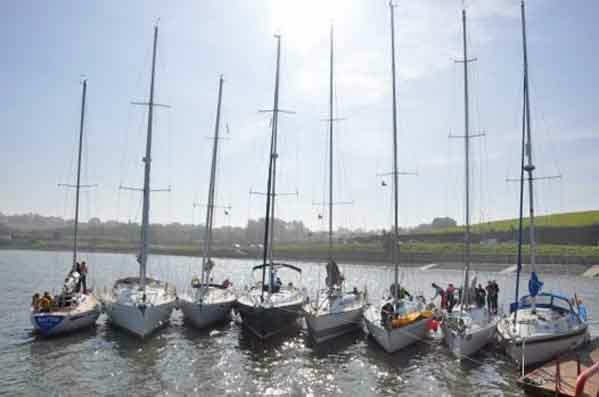 The GP14 Class again came to Rosses Point for their Irish National Championships in 2005 as a prelude to the World championships of the GP14 Class which was hosted by Sligo Yacht Club. The event took place from July 30 to August 4 2006, and was the first major test for the new Clubhouse. SYC has excellent facilities and beautiful sailing grounds. Cruiser racing takes place on Wednesday and Friday evenings while dinghy racing is on Tuesday and Thursday evenings and Sunday afternoon. Sailing season is from April to September. Bar open on sailing days. Courses run throughout the summer months. 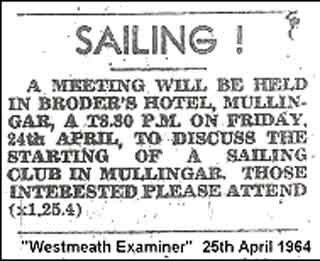 The club was formed on the evening of Friday 24th April 1964 at a meeting in Broder’s Hotel, now the Newbury Hotel, Mullingar in response to a notice placed in the 'Westmeath Examiner', by Keith Pinder, calling for a meeting of people interested in sailing. At this inaugural meeting a committee was formed whose first task was to find a site from which to sail. This first committee consisted of: Commodore, Dr. G. Jackson. Hon. Secretary, Keith Pinder. Hon. Treasurer, Ivor Fogg. Committee, Dermot Bannon, David Gibson-Brabazon, J. O’Donnell, C. Corcoran, Mrs Farrell and Mrs. Jackson. Due to the sudden death of Dr. Jackson later that year, Dermot Bannon was elected as Commodore. For the first few years, we sailed from a field, on the shore of Lough Owel on Joe Dolan’s land at Portloman. The GP14 was the class we adopted having been recommended by Greg Petrie; a decision never regretted. Four members ordered boats in kit form and built them (some of these boats are still sailing well), and having no previous sailing experience, members taught themselves to sail over the following few years. Organised club racing that followed helped to improve the standard of sailing considerably. In the time sailed from Dolan’s we had our first regatta in 1965, actually sailed from Dermot Bannon’s land further up the shore at Portloman. With more space to erect the necessary marquees, etc., and for visitor access, we hosted a number of meetings from Lough Ennell. As well as for GP14s, classes catered for included, Shannon-One-Designs, Enterprises and Fireflies. So that we could grow, it was decided that we needed a site with better access and boat parking facilities and a search for one started. The site decided upon was one offered by Phillip Ginnell at Mullally’s where we are now and moved there in the season of 1970. This same year we held our first IYA, now the ISA, sail-training course using the Mirror dinghy we had then recently adopted for junior sailing; these annual courses are still being run today. The site was bordered with a fence in 1971 and since then the site has grown steadily. We have had two clubhouses prior to our present one. The first was a mobile home purchased in 1984; a little cramped, it got us in out of any bad weather in which to change and meet. Unfortunately a violent storm blew off its roof and, though it was replaced, the mobile home was never quite the same again. 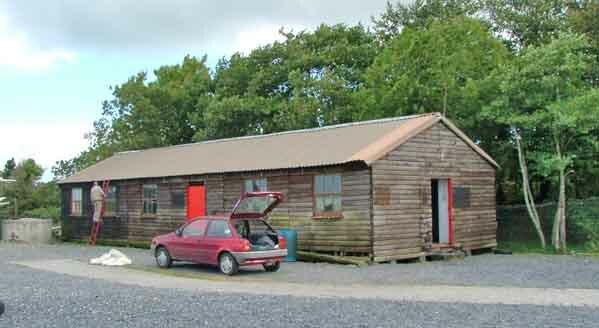 An old disused army timber barrack hut erected by club members in 1987 replaced this. It served us well for many years until it was dismantled, removed and replaced by the present, custom-built clubhouse officially opened in November 2004. We have hosted a number of important meetings. As well as the various GP14 championship and open meetings, we have hosted the 470 class Carlsberg Warrior Trials in 1973, a roving trial at which the Irish 470 squad was determined for the 1976 Olympic Games in Canada. Sailed in 1978 in fresh winds we hosted the Optimist Leinster championships and, more recently, in 2004 hosted the Fireball Nationals in May of that year. Later in September we had the GP14 Autumn Open Meeting sailed in strong winds. During Easter of 2006 we hosted the Mirror Leinster championships and in October we have the GP14 Frostbite meeting: Brass monkeys need not apply! Finally, Two members have received public honours in recognition for services to sailing. The first was Keith Pinder who, in 1998 received the Westmeath All-Stars award for his services to sailing in Co. Westmeath. The second was Kieran Milner who was awarded the ISA Volunteer of The Year award in 2002, again for his services and contributions to sailing. Private club honours have gone to Keith Pinder, Ivor Fogg, David Gibson-Brabazon, Robert Heath and Garry Walshe who were awarded honorary life memberships of the club in December 2002 for their services to the club. 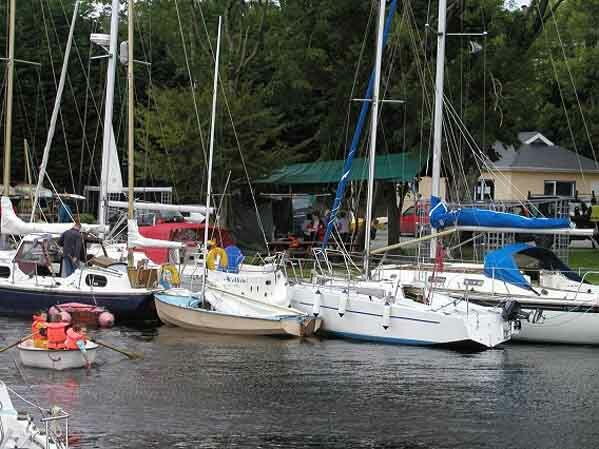 Founded in 1770, Lough Ree Yacht Club is the second oldest sailing club in the world. The tradition of organised pleasure boating in Athlone goes back to at least 1731, with a regatta on the Shannon amongst the 'diversions' promised for a festival week in the town. Early activities appear to have involved a rendezvous at some agreed place and a cruise in company in the manner of a naval flotilla but racing eventually developed. From its earliest days it was known as Athlone Yacht Club and was renamed Lough Ree Yacht Club in 1895. At that time the lion and roses from the arms of Athlone town were also adopted as the Club burgee. Junior sailing was introduced to the Club in 1968 in the form of a dozen Optimist dinghies, and this fleet has expanded and thrived most successfully since that time being joined by Mirrors and Lasers in recent years. Cruiser racing has returned to prominence over the past thirty years with a mixed handicap fleet and the J24 one design was adopted as a Club class in 2000. The Club has made rapid strides in recent years, particularly by the acquisition of more property, and the extension and improvement of the premises and provision of fixed and floating jetties. Sailing activity is currently at a high level and the Club continues in the tradition of its 237 years to be a convivial centre of sailing on Lough Ree and the host to many important sailing events. The former slipway, moorings and hangar are now used for members' sailing boats, power boats and caravans. The Clubhouse, with changing rooms, bar and social facilities was built in the 1960s & 1980s. A marina containing berths with full water and electricity was completed in 1992 and an extension with space for an additional 28 berths has recently been added. Winter 1940 brought flying boats to Gublusk Bay. RAF Stranraer had been set up in August, but Lough Erne was over a hundred miles closer to the mid-Atlantic, where air cover was urgently needed by convoys under attack from U-boats. Two boats from Stranraer surveyed the Lough from the air at Christmas. In January, the Free State Government secretly allowed flying straight to the Atlantic via the Donegal Corridor. In February, RAF Stranraer’s 209 and 240 Squadrons were re-equipping and training with Catalinas, and began to use Lough Erne. These handy aircraft carried a full service kit so their crews could set up a first base quickly on any sheltered beach. 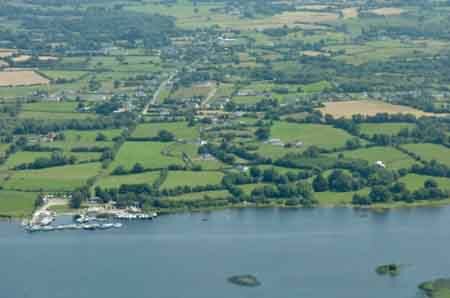 Thus did RAF Killadeas begin along the sheltered north shore of Gublusk Bay, nowadays the home of our Lough Erne Yacht Club. The first photograph shows Catalinas on Gublusk shore in mid-winter 1941, engines under corrugated iron canopies for servicing, a hospital under construction on land north to the Manor House, and a big boat shed, half built – today called the Hangar. A hatched line marks the edge of the planned concrete hard standing. The work was done by US servicemen under Ivan Bicklehaupt USN, in civilian clothing. A couple of years later, his men used Killadeas experiences as similar US Navy Catalina forward bases were set up on Pacific island beaches in the Japanese war. On 12 March, first casualties were all of a 240 squadron crew in a Catalina out of RAF Killadeas that hit a hill and burnt in Leitrim. On 27 March, 209 and 240 transferred from Stranraer to RAF Killadeas. Another 240 crew were all lost on 7 May when a Catalina from RAF Killadeas crashed in flames mistaking a landing onto mirror-calm water near Gay Island. They are remembered today by one of Joe O’Loughlin’s memorial stones nearby at the Marina beacon. Training was rewarded three weeks later on 26 May, when a Catalina from 209 found the Bismarck on her way to France after sinking the Hood, and handed over to another from 240 to follow this dangerous battleship. She was sunk next day. Thereafter, for the crews of the Catalinas, and the Sunderlands from Castle Archdale, the war was rarely so glamorous, but often dangerous, uncomfortable and boring. They flew whatever the weather. Landing in summer sunshine from clear air to calm water was a puzzling danger. Navigation, hundreds of miles off-shore was another dangerous puzzle, particularly in the dark, freezing, blinding fury of winter Atlantic gales and driving snow storms. A few planes were shot down. Many flew out and did not return. Perhaps fifty crashed on coastal headlands in the lough or on inland hilltops. Joe O’Loughlin recorded 330 casualties onto Rolls of Honour by Catalina, Sunderland and land plane, and presented these on Remembrance Sunday 2005 for display at LEYC, Castle Archdale and St Angelo. RAF Killadeas expanded in mid-1942 to include OTU 131, an Operational Training Unit, where individual pilots, navigators, gunners and radio operators, trained in Galloway and elsewhere, became crews and learned to operate together patrolling the Atlantic hunting submarines in Catalinas, and later in Sunderlands. RAF Killadeas became a big place, with accommodation for 2,800 RAF personnel, and a new Catalina slipway on the east shore of Gublusk Bay. Most from OTU 131 were posted elsewhere. Canadian pilot, Bud Crooks, who unveiled Joe O’Loughlin’s OTU 131 memorial stone at LEYC Flagstaff in 2000, remembered flying his Sunderland to the Far East after training. When the war ended, and its longest running battle, the Battle of the Atlantic, RAF Killadeas closed down, leaving surplus buildings and scrap aircraft, boats, tools and equipment. A plan to make the site into a Butlin’s Holiday Camp did not happen. Corrugated iron scrap from buildings was sold to Belfast, and some used for Casement Park GAA stadium. LEYC has been on the site since 1950. Likewise, Stranraer Sailing Club is on the old RAF slipway there. Our historic Fairy keelboats have wintered in the Hangar for over 50 years, a major reason for their survival to centenary in 2006. In summer, they launch down a WW2 slipway to lie on flying boat moorings, while hoisting their 1906 gunter mainsails. Catalina service bays now hold the RNLI Station, LEYC’s BBQ and children’s dinghy racks. Rings that held Catalinas down in gales now secure catamarans. The refuelling jetty snugly berths a barge. Peace now, where once was war. A second picture show Catalinas over RAF Killadeas about 1943, left foreground is the amphibian Catalina slipway under construction, with boats and aircraft in Gublusk Bay and around, and Devenish in the distance. A third shows Doreen, about 45 years later, moored by a chain to a clump on the bottom made for flying boats, her crew raising sail. Copies of longer reports in the local Fermanagh press and loan of a DVD of the ceremony at LEYC are available. A century ago, the grand Crom era in LEYC’s history was at its height. A water-colour from then, showing a becalmed Two-Rater racing yacht off Crom Castle, graces the front cover of this 2005 editionof the Clogher Record. Inside The Sailing History of Lough Erne is set out in 40 pages, from the Maguires in the 1500s, to Big Houses and ‘pretty yachts’ in the 1700s, to yacht racing’s 1818 pioneers, The Subscribers to the Boat Races on Lough Erne, for the encouragement of fast Sailing Boats, and for the improvement of the Navigation, then Two-Raters, Colleens and Fairy keelboats, Enniskillen Yacht Club, and today’s LEYC sited on the former WW2 flying boat base RAF Killadeas. The Clogher Record, journal of the Clogher Historical Society, is circulated to its members and to many universities, libraries, museums and historical societies. The then LEYC Admiral, John Phillips acepted a copy presented to the Club which is in the Secretary's files and available to members. Ther is also a copy in Enniskillen Library, local history collection. The club is located on Lower Lough Erne, Co Fermanagh, about 6 miles north of Enniskillen just off the main Enniskillen- Kesh-Belleek Road. LEYC has a long history of competitive sailing at a national and international level and was one of the first clubs in Northern to achieve the national standard of Volvo RYA Champion Club in 2002 To gain the award, clubs must operate an approved scheme of youth sailing and race coaching which both introduces young people to sailing and helps them compete at different levels up to international standard. Iniscealtra Sailing Club (ISC) is located on the shores of Lough Derg at Mountshannon, Co Clare, Ireland. It takes its name from the nearby monastic island known as Inis Cealtra or Holy Island (English). The club was founded in the late sixties and is comprised mainly of a sailing cruiser fleet. Initially the small number of boat owners met, socialised and raced from the main harbour in Mountshannon. Most members hailed from the Limerick region. However with the increase in numbers gathering, plus the increase in boats using the main harbour, the club looked around the immediate area and made a decision to purchase a prime site on the shores of the lake, adjacent to the main harbour, from where they could run the club events. In 1984 the club formed as a company limited and in 1985 land was purchased by the club, adjacent to the public harbour in Mountshannon. The deeds were signed and ISC became the proud owners of the new club site. Plans to develop this land were started and today a fine harbour, club house, parking and recreational areas have been developed and nurtured by the loyal members. The number of members increased and the interest in sailing and racing the sail boats grew progressively. In the late ‘80s, plans were drawn up for a club house facility which has now been built and comprises of toilet facilities, showers, kitchen and a meeting/general use room. There is on shore water and power with berthing facilities to tie along side. The site is private and maintained by the members and allows for families and sailors to meet and socialise together when using their boats. A small slip allows sailors to access their moorings with the use of the club dinghy. The depth of the water is approximately 6-7 foot providing sufficient depth for most sailing boats. The club is run by a committee who meet monthly to discuss all the club activities, planned events, racing calendar and other general issues. The committee operates on a voluntary basis and work to provide a well run, family orientated and sporting club for all members. The aim is to provide facilities for both larger and smaller boats and to introduce junior members to dinghy sailing.